Its Final Four Weekend! 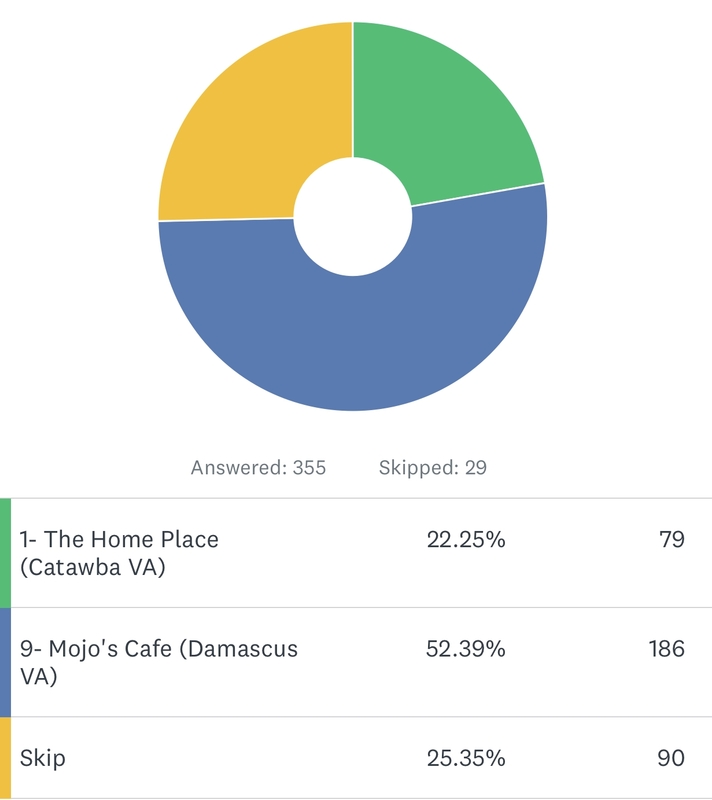 We started with the top 32 restaurants on the AT, seeded and created a bracket, then you voted. Each round, we narrowed the field and voted again. It’s time for you to decide what restaurants advance to our Championship Round. 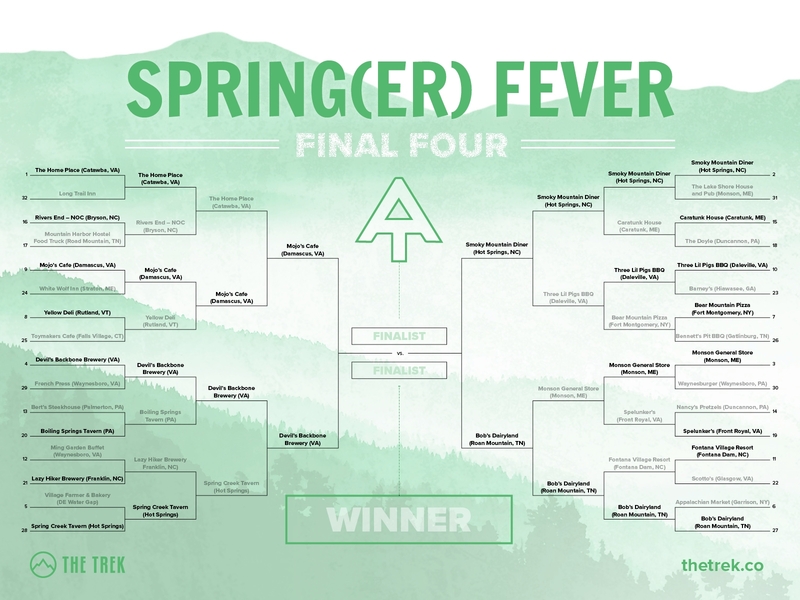 Final Four voting ends midnight 4/6 (PT). Championship round will follow 4/7 to 4/8. #9 Mojo’s Trailside Cafe & Coffee House took down the top seed, The Homeplace, by a landslide 107 votes. They will face #4 Devils Backbone Basecamp Brewpub, who defeated #28 Spring Creek Tavern by only three votes. #2 Smoky Mountain Diner matches up against #27 Bob’s Dairyland. Both restaurants won their previous rounds easily to advance to the final four. Bob’s Dairyland knocked out #3 seed Monson General Store, the only remaining restaurant above the Mason Dixon Line. Can the underdog Bob’s Dairyland keep their streak going as they face the #2 seed? Go vote and decide who advances. We love Bob’s Dairyland! Such a great place to eat! Bob’s Dairyland has the best food and the service is great! 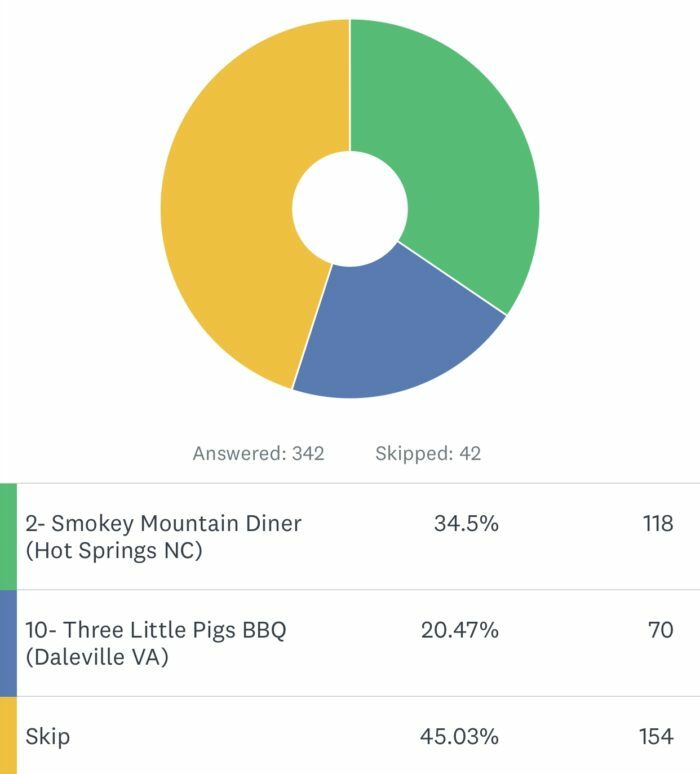 Smokey Mountain Diner and Mojo’s Cafe should advance. Great food and service from locals who like to hike and love hikers. And, the SMD is only 21 steps from the AT! The Homeland all the way!! The best!! Bob’s Dairyland is the BEST!!! Spring Creek Tavern in Hot Springs NC was my favorite but really, all the places were awesome! Not sure if you’re counting B+B’s but the 1/4 way inn set the bar high early on, and wasnt surpassed.